Originally published on Thoughtful Campaigner. By Tom Baker. One of the things I most enjoy about going on holiday is the opportunity to dip into a good book or two. 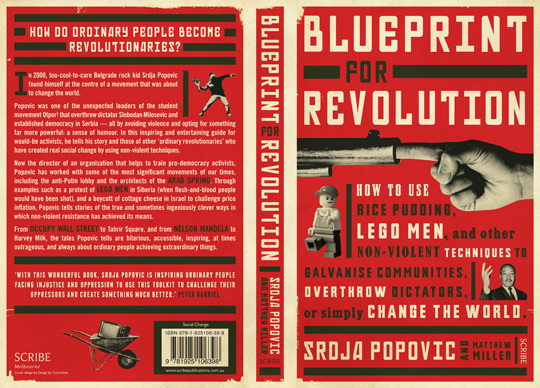 Over the last week I’ve really been enjoying Blueprint for Revolution – How to Use Rice Pudding, Lego Men and Other Non-Violent Techniques to Galvanise Communities, Overthrow Dictators or Simply Change the World by Srdja Popvic. Popvic is one of the leaders of the CANVAS (The Centre of Nonviolent Actions and Strategies), the Serbian based organisation that was behind the movement overthrowing Slobodan Miloševi?, and has taken these lessons to help other movements around the world (this is a good read on the work of CANVAS). It’d be easy to think that the book is only intended for those who are interested in learning about overthrowing dictators, but it’s not. I found the book packed full of practical insight and brilliant stories that are relevant to anyone involved in campaigning. It’s an easy and enjoyable read, with Popvic mixing a range of stories from his personal experience with lessons from history. I’ll be recommending it to anyone who asks me about what makes a good campaign as it’s packed full of practical wisdom that could be applied to anyone involved in movement building. 1 – Focus on small victories to build your movement – those campaigns that focus first on small achievable battles that they can win are more likely to succeed. They understand that victories can help to give your supporters confidence that they’re part on a winning side, and also help to attract others to your cause. 2 – It takes time to plan your strategy – Popvic shares a lot about the time Otpor! in Serbia took to plan and build for the actions that they then took. He’s at time critical of movements that he feels have moved to action too quickly. To be successful you need to be meticulous as you can in your planning and preparation. Leave nothing to chance. 3 – Change comes when two or more groups come together for mutual benefit – campaigns can’t be won if they just reflect the views or worldview of just one group with a community – they need to bring together different groups. Throughout the book is the message that building unity, community and trust with others is central to anyone who wants to win. 4 – Focus on the ‘Pillars of Support’ – remembering the work of Gene Sharp, who suggested that every regime is held in place by a handful of pillars – apply enough pressure to one or more pillar, and the whole system will soon collapse. But this means thinking laterally and considering what the pillars are – for example for using businesses which have close connections with those you’re looking to target. See this for how the concept has applied to the campaign for equal marriage. 5 – Make it funny – campaign can be a serious business, but Popvic is a big advocate of using ‘laughtivism’ as a tool for change, using humor as a way of undermining your target, but having some fun at the same time. The book is, as they say, available from all good bookshops – I’d highly recommend it.